At 4Luggage.com, you can find one of the largest online selections of luggage and travel accessories. 4Luggage.com sells garment bags, hardside and fabric luggage sets, and carry on bags. Messenger bags, briefcases, and computer cases are also on sale at 4Luggage. In addition, 4Luggage carries backpacks, duffel bags, sports bags, and hand bags. You can also buy travel accessories at 4Luggage.com including: locks, clocks, luggage straps and tags, and shoe bags. RetailSteal.com has the best 4Luggage.com coupon codes, 4Luggage.com discounts, 4Luggage.com coupons, and 4Luggage.com promo codes. Shipping and handling rates at 4Luggage.com depend on the pricing of your purchase and your shipping destination. See website for full details. Exclusions may apply. Use this coupon code and eBillMe at 4Luggage.com to save $10 on orders of $100 or more. 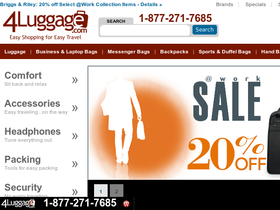 Shop online at 4Luggage.com and enjoy up to 50% off sale luggage. Shop at 4Luggage and get free shipping on orders over $99. Click link now. Save $100 on wheeled Luggage and Carry-Ons from 4Luggage.com. Click link to shop online. Save 40% on your online order of Hartmann Vera Wang Signature Collections at 4Luggage.com. Click link to shop now. Buy Hartmann Tweed Luggage and save $100 on your order at 4Luggage.com. Click link for savings. Save $85 at 4Luggage.com when you buy a Hartmann Zoom Pet Carrier. Click link to purchase. Shop at 4Luggage.com and save $50 on non-wheeled Totes and Luggage. Click link to save. Buy kids' luggage with pieces starting at $30 online at 4Luggage. Click link to buy. Shop at Irv's Luggage and enjoy $15 savings on orders $125+. Click here for code. Shop at Irv's Luggage and receive 20% savings on the Briggs & Riley BRX collection. Click here now. Act now and take advantage of a $5 discount on your order of $50+ with this coupon code from Irv's Luggage. Buy Samsonite Luggage at Irv's Luggage and take 70% off your order. Click link to purchase. Get up to 75% off laptop bags and accessories at Irv's Luggage. Click link to shop online now.